what's in your day pack? Re: what's in your day pack? the next question I like to add would be: how much your day pack weighs? When close to the camp I would insist to limit it to 4 # max. Belts and nets for carrying included. Someone asked for pics. Here is my work in progress. The cat quiver mini is put on with some seriuous Velcro from wally world. Can hardley separate the stuff, it's on there good. I have all my hunting essential in the outer pockets, with lots of room left over. The relaxed large part of the pack is completley empty and at least the size of a 5 gal bucket. Plenty of room to spare for clothing/lunch etc. I'm trying to keep the weight down. 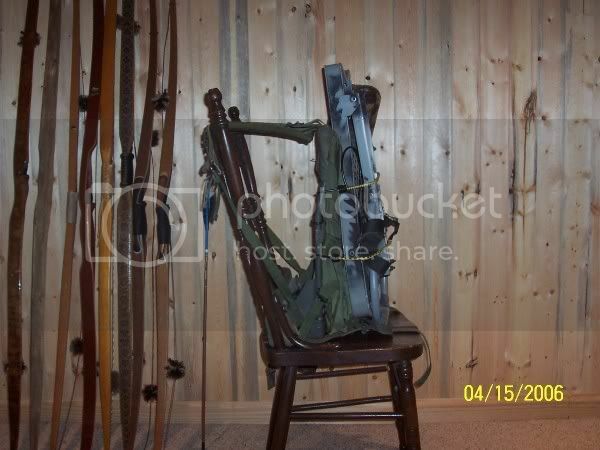 It weighs 15 lb with the treestand. You can see by the side view that it is actually pretty compact. I have all the tree climbing gear in there including a woodpceker drill, pegs and linemans belt. Can't wait to try it all. No more passing on a big ol doe back in the hills just because it's to far to drag her out. I have two garbage bags in there for meat bags. I plan to field quarter and pack out. BTW, the best way to work on your pack is in the reversed position on a chair. It stands right there for you. I store it that way. Mine is packed full of late-season clothing and gear for an all-day sit here. Getting a deer out isn't a problem in most of the small farms I hunt in my area. You must have some legs! You are prepared for anything. I used the lone wolf for the last 5 years. The hills are getting steeper where I hunt, if ya know what I mean. Thanks for the pictures of your set up. 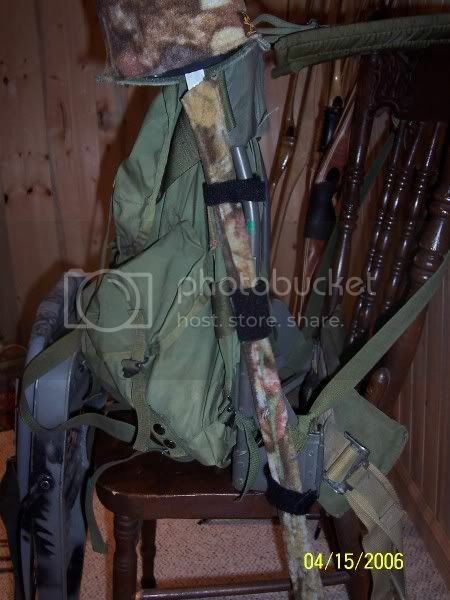 I don't like bow mounted quivers and the back and hip quivers that I have tried are ok but most do not allow the caring of other gear and supplies. Your system appears to be just what I have been searching for. 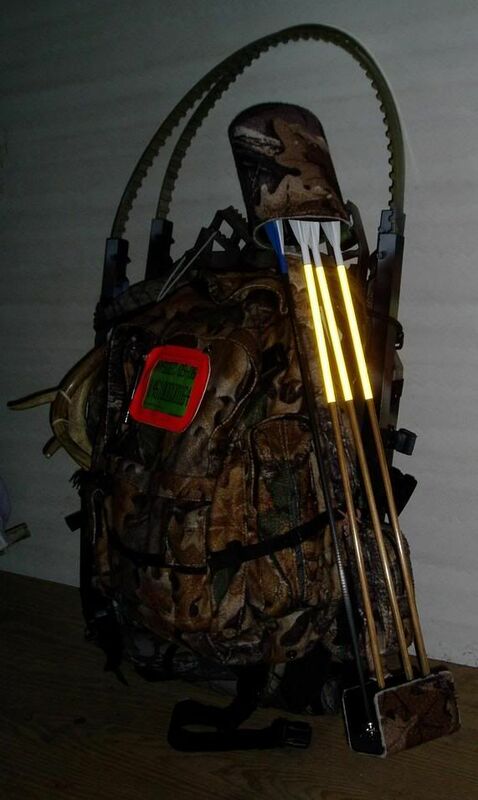 So I believe that I will have get busy and see how I can modify and adapt my alice pack to carry my arrows and other gear. I will post some pictures when I get it done. Its true that a picture is worth a thousand words and they sure provide food for thought! This assortments served me well from the NY woodlands to Iowa woodlots, right on up into sitting over a Colorado Elk Wallow. 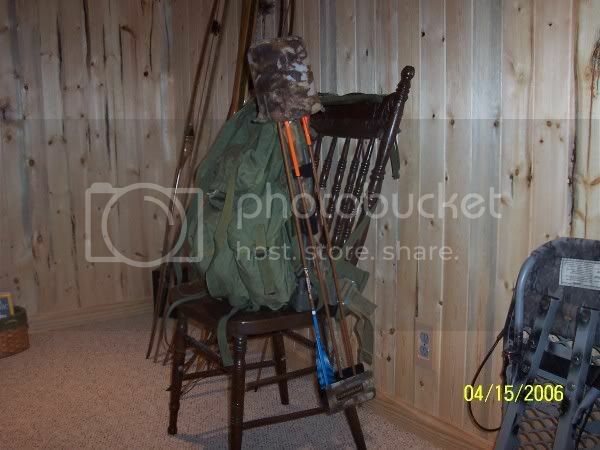 I do think the the lone wolf is the best treestand for shooting out of. BTW, make sure your hand climber pc has the larger 5/15" bolts in it. If not call lone wolf and get some before you use it again! Please add this to your packs...ASPRIRN. Unfortunately some of you will have a heart attack hunting. A couple aspirin could save your life. And it helps clean the cobwebs after a groggy mid-day nap. I often find myself with a headache on the first day of a 2-3 day hunt. I think its the stress of driving 150 miles, lack of sleep, slight increase in elevation.